• SpO 2 , respiratory rate, pulse rate, BP, Temperature , and peak flow (if possible). • Chest X ray (look for pneumothorax, hyperinflation, bullae, and pneumonia). • ABG (or capillary blood gas), documenting the FiO 2 . Use pCO 2 to guide O 2 therapy. • CBC, U&E, glucose, theophylline levels and, if pneumonia is suspected and/or pyrexial, blood cultures, CRP, and pneumococcal antigen. • Send sputum for microscopy and culture if purulent. Give O 2 — remember that hypercapnoea with O 2 is multifactorial. 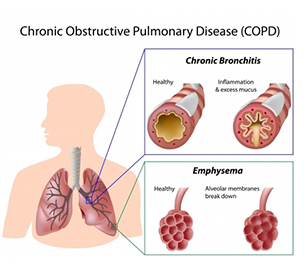 The aim is to maintain SpO 2 88–92 % without precipitating respiratory acidosis or worsening hypercapnoea . If the patient is known to have COPD and is drowsy or has a documented history of previous hypercapnoeic respiratory failure, give FiO 2 of 28 % via a Venturi mask and obtain ABG. Titrate up the FiO 2 with serial ABG sampling until the minimum FiO 2 that achieves SpO 2 88–92 % . Reduce inhaled oxygen concentration if SpO 2 > 92 % . • Give nebulized salbutamol 5mg or terbutaline 5–10 mg.
• Consider adding nebulized ipratropium 0.5mg. • Use O 2 driven nebulizers unless the patient has hypercapnoeic, acidotic COPD, in which case use nebulizers driven by compressed air, supplemented by O 2 via nasal prongs at 1–4 L/min. • Give steroids (eg prednisolone 30 mg PO stat or IV hydrocortisone 100 mg). • Give antibiotics (eg amoxicillin, tetracycline, or clarithromycin) if the patient reports increased purulent sputum, or there is clinical evidence of pneumonia and/or consolidation on chest X ray. • Consider IV aminophylline or salbutamol if there is an inadequate response to nebulized bronchodilators. • Consider naloxone if the patient is taking an opioid analgesic that may cause respiratory depression.